Under the Sino-British Joint Declaration signed on 19th December 1984, Hong Kong became a Special Administrative Region of the People's Republic of China on 1st July 1997. To commemorate this occasion, the Hong Koing Monetary Authority issued a set of seven beautiful coins. 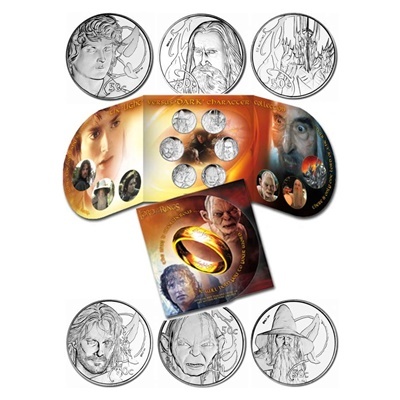 The set of seven coins are in the same denominations as the seven coins in circulation - 10 cents, 20 cents, 50 cents, $1, $2, $5, and $10. They are identical to those in general circulation except for the special commemorative designs on the reverse sides. This set of "Brilliant Uncirculated Coins" were newly struck and carefully selected by the British Royal Mint and sealed in a protective jacket. On the obverse, each of the seven coins bears the standard Bauhinia design with "Hong Kong" in both Chinese and English. On the reverse, the denominations are struck in Chinese, English and Arabic numerals. The year of issue is positioned on the left and right, in two parts, with a special commemorative design in the centre. Presented in a beautifully-illustrated presentation folder.